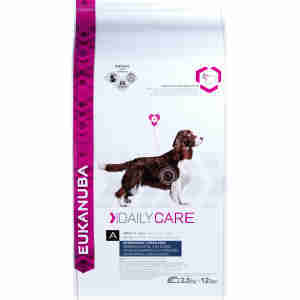 Suitable for all breeds of adult dog, Eukanuba Daily Care Overweight Sterilized provides the nutrition your neutered pet needs in one complete low-fat meal. Containing 15% less fat than regular weight loss food, this all-in-one meal can help your heavier or neutered dog achieve their ideal weight. Essential fatty acids omega-3 and -6 have been included in the mix to keep your pet's hair, skin and heart healthy. The recipe contains L-carnitine, which helps to reduce body fat while developing lean muscles. Each bowlful provides protein to give them a boost of energy, encouraging them to be more active while exercising. Added prebiotics and beet fibres ensure that the food can be easily digested, helping them feel satisfied. This also helps the added vitamins A, C and E to be absorbed in the gut to support a healthy immune system. The 3D DentaDefense kibble scrubs their teeth while they eat, reducing the build-up of plaque and improving their oral health. Neutering your dog after the age of six months has many benefits, including making excitable dogs calmer and less aggressive. One effect of sterilising your pet is that they may gain weight in the months after the procedure. They can benefit from switching their regular food for a lighter alternative. This will prevent excess fat being stored in their body, and can help them to maintain a healthy weight throughout their lifetime. Eukanuba food can also help overweight dogs to reach their optimum size. Consult your vet if you're concerned about your dog's health. very prompt and speedy delivery at a good price. I have been using Eukanuba Joint Sensitive for my Labrador for over 4 years. He is fit, healthy and energetic has no weight issues and a beautiful shine to his coat. Although this food may seem expensive you feed less than some other brands, which also means fewer toilet stops. Best of all my dog loves it! Great, easy to use diet food it has worked a treat on my over weight chocolate labrador but you must feed the ammount for the weight the dog should be not the weight it is. I have used this food for over 2 years for my chocolate lab as he was a couple of kg overweight and not only did it help him loose the required weight but it''s also helped him loose it steadily and keep it off. He is now on Eukanuba senior food and loves it.